Imagine a technology that was the size of a shoebox, did not use ionizing radiation, did not require breast compression, and could detect breast cancer at an early stage. Would this not be a real winner? 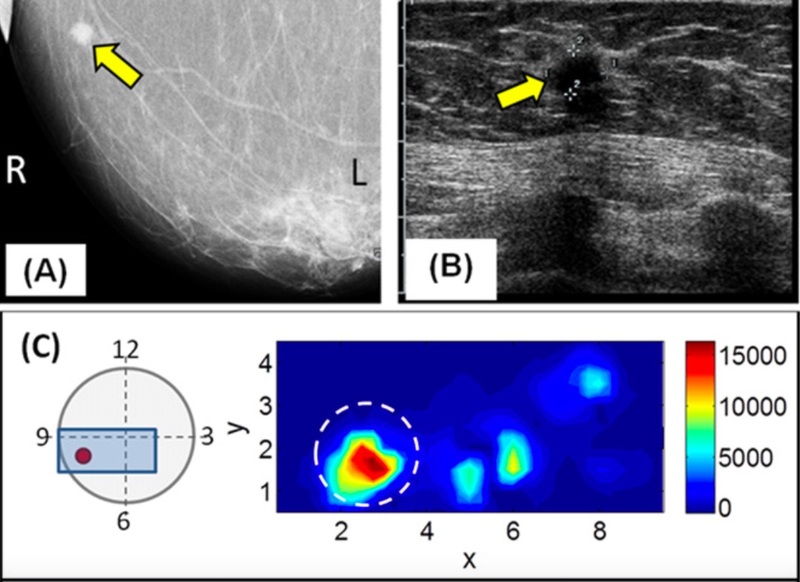 Well, just a few weeks ago a paper entitled “Non-invasive surface imaging of breast cancer in humans using a hand-held optical imager” was published in Biomedical Physics & Engineering Express and would appear to offer considerable promise. What distinguishes this paper by a group of researchers from Florida International University in Miami is that they compared their results with traditional imaging modalities like mammography, ultrasound and magnetic resonance imaging. Their technology is based on diffuse optical imaging (DOI), a relatively inexpensive method that uses a near-infrared diode source to produce an image of the breast tissues by mapping the optical absorption which is altered by haemoglobin concentration, a measure of protein in the red blood cells. Malignant breast tumours lead to angiogenesis – the development of new blood vessels to feed the cancer – and so an increase in either oxy- or deoxy-haemoglobin levels might suggest the presence of a tumour. 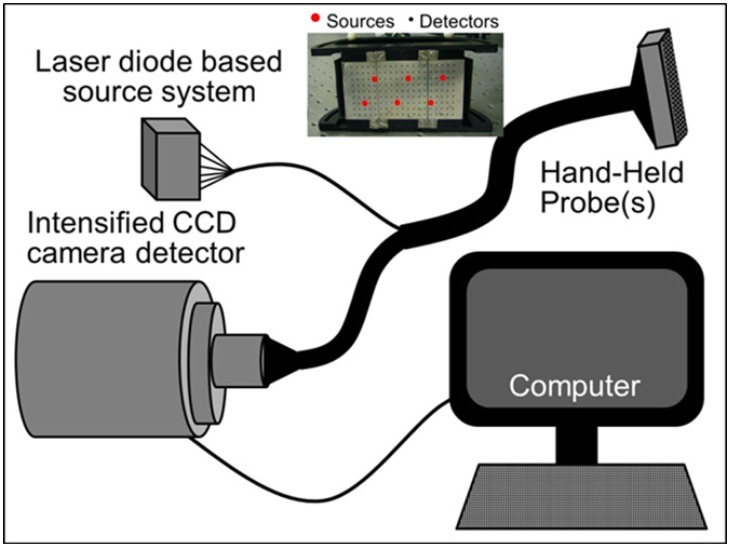 As seen in the diagram above right (© Institute of Physics), the DOI device consists of a laser diode source and a charge-coupled detector (CCD) camera that are connected to a hand-held probe. The probe, 4 cm x 5 cm in size, is manually scanned across the woman’s breast while she lies in a semi-recumbent position in a chair. The authors studied five patients with biopsy-confirmed breast cancer: three diagnosed with invasive ductal carcinoma, one with ductal carcinoma in situ (DCIS), and one with metastatic disease. As seen at left (© Institute of Physics), there was reasonable agreement between the mammography (A), ultrasound (B) and DOI images (C). The yellow arrows indicate the position of a tumour in the left breast that is 9 mm in size, although the researchers acknowledged the presence of artefacts in their DOI images. First author Sarah Erickson-Bhatt reported that most women commented how comfortable they felt, while co-author Anuradha Godavarty added “Eventually, we hope that physicians will be able to use this device for real-time imaging of breast tissues as part of regular visits. We’re currently working on the mathematical tools to process the images and produce 3D tomographic images, to determine tumour size and growth.” The authors acknowledged that extensive clinical work – not to mention substantial technological development – still lies ahead before DOI becomes a viable screening platform for early detection of breast cancer. Dear friends. This was a very interesting item, because I also read an article in the newspaper about the functionality of accurate screening. In the Catharina Hospital Eindhoven The Netherlands, they have started a trial by placing Radio active isotope Jodium 125 in the detected tumor and the results are surprising very good. Details or information be asked via the oncology department of this hospital.